Responding to volatile criticisms frequently leveled at Leo Strauss and those he influenced, the prominent contributors to this volume demonstrate the profound influence that Strauss and his students have exerted on American liberal democracy and contemporary political thought. By stressing the enduring vitality of classic books and by articulating the theoretical and practical flaws of relativism and historicism, the contributors argue that Strauss and the Straussians have identified fundamental crises of modernity and liberal democracy. This book emphasizes the broad range of Strauss's influence, from literary criticism to constitutional thought, and it denies the existence of a monolithic Straussian political orthodoxy. Both critics and supporters of Strauss' thought are included. All political theorists interested in Strauss's extraordinary impact on political thought will want to read this book. 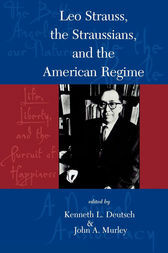 The significance of Leo Strauss for the theory and practice of American politics is limned in this thought-provoking volume. Kenneth L. Deutsch is professor of political science at State University of New York at Geneseo. John A. Murley is professor of political science at the Rochester Institute of Technology.